I finished this dress tonight. I really like how it turned out. The only modifications I made were to sew in an invisible zipper rather than what the directions called for: a contrasting zipper that is sewn on the outside. I also did not sew the tuck the is supposed to be at the bottom of the dress. I thought it was unnecessary. It's pretty low cut, but with a cami underneath, it should be fine. 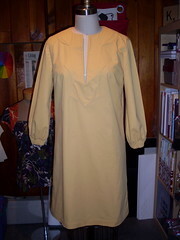 I'm thinking of making this dress and wondered - how difficult is the pointed yoke to make? I thought the yoke would be difficult to sew too, but it was very easy.